Welcome to Not-My-Typical-12x12 Week here at Daily Life - Bits & Pieces. Each day this week I'll be sharing a layout that is not my traditional 12x12 layout. These layouts will be various sizes and formats. 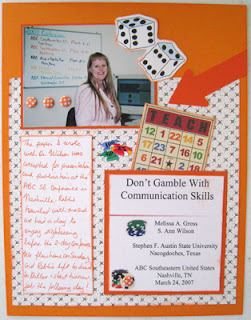 Today's layout is an 8 1/2 x 11 page about our trip to Nashville, Tennessee in March of 2007. I've actually created several pages about this trip showcasing photos of our tour of the Grand Ole Opry, our visit to Cooter's Place, a nice dinner out, and documenting a fun Minnie Pearl story from my high school years. However, I had not yet documented WHY we were in Nashville to begin with. Journaling reads: The paper I wrote with Dr. Wilson was accepted for presentation and publication at the ABC SE conference in Nashville. Robbie traveled with me and we had a day to enjoy sightseeing before the 2-day conference. We flew home on Sunday, and Robbie left to drive to Dallas to start his new job the following day! I included a printout of the opening slide of our presentation, which provides all the relevant information about the presentation - title, authors, the university we represented, and the conference & location. We had used Kenny Roger's The Gambler song as inspiration for the points we wanted to make in our presentation about communication skills, thus the title Don't Gamble with Communication Skills. I had a few dice and poker chip embellishments that worked perfect on this layout. The photo was actually one taken of me in the ABC office (not in Nashville), and I thought there was too much white space, so I added a few of those fun candi dots to fill it in a little. I like the way the 8 1/2 x 11 size worked perfect for this layout, leaving plenty of room for journaling and a few embellishments. Have you created any 8 1/2 x 11 layouts lately? Like the way all the bits contribute to the theme so effectively - looks like a day of enjoyable achievement! Yes, I tend to scrap 8.5 x 11 in preference to anything else now. This is a really interesting lay-out. I always do 12x12 but should really try 8 1/2x11. I like the way you have cleverly used the gambling ephemera to connect to your title. I've only tended to do A4 (the UK equivalent to 8 1/2 x 11) when I've done a digi layout, because I can print A4 but not 12x12! I then print the basic layout onto cardstock, print the photo(s) on photo paper, and mount the whole lot onto 12x12 cardstock so it goes in the same albums as my 'paper' layouts. Having said that, one thing I want to experiment with as part of Project Life next year is adding in layouts of all kinds of different sizes by using a variety of page protectors in the same album. So watch this space!! I have only one album that is 8-1/2 x 11. I must admit it is easier to get page protectors in that format. My favorite album size is 8x8. I really love the way you have pulled together all the elements of this fantastic page Melissa. I did my Journal Your Christmas album this size a couple of years ago and I enjoyed it very much. Need to get back to it I think! Love the colours and added elements and when I saw the photo I did wonder if they were candi dots, I have been using those quite a bit recently. Did google to see if the paper was on line but sadly no, 2007 was before such things I suspect. I make 8.5 x 11 pages on a regular basis, I don't like working with A4 - I think it smacks too much of work for me! I like a mixture of page sizes in my albums and it depends on the story which I decide on. I started out doing 81/2 X 11 almost exclusively, but I'm doing more 12X12 now. I have more photos and larger collages of photos so a smaller format doesn't work as well. I like both though, and put them all in the same album. Great layout. I love the the way you incorporated the program. This is a great page - all the necessary information presented in an attractive layout. I don't do 8.5 x 11 - ever! this is cute. I haven't done an 8 1/2 x 11 in years!